I’ve noticed in myself that as my understanding of the gospel grows the words I use matter more. You can probably guess words are one of my major love languages. Yesterday in church I heard someone use a phrase I’ve heard hundreds of times, “The Lord will find a way.” It’s never bothered me before, but yesterday it hit me like a ton of bricks. He will find a way? That brings to mind a bumbling God and Savior who are trying to problems solve solutions after the problem or deviation has presented itself. It reminds me how my GPS unit takes time to recalculate when I deviate from the course prescribed. How can a God or a Savior be truly be omnipotent if that is how they run the show? How can an atonement be truly infinite if the solutions come only after the deviation has happened? I guarantee you that is not how things go. The Lord doesn’t find the way, He knows the way. He knows the way before the problem even starts. He knows the way before you are even born. He is not searching for solutions to our problems after they pop up, as we do. He is first guiding us to the problem or difficulty and then He guides us through the problem or difficulty. These are not last minute patch job solutions, but are a part of our pre-charted course to give us the best possible opportunity to return to Him. You may be thinking, “What about agency? If my course is charted out for me how do I have the option to choose?” Well, remember he is omnipotent. His perfect knowledge includes a perfect knowledge of us. When I serve my kids dinner I am not forcing them to like it, but I know which dinners they will like. When I’m buying my kids Christmas presents I’m doing it with the knowledge of what they will enjoy or what they need. I know my kids fairly well, and so without taking away their choices I can plan for them. Our Heavenly Father knows us perfectly, our choices do not surprise Him. They may sadden him, they may cut us off from him (our doing, not His), but they do not surprise him. But deep within his soul was a power that far exceeded the powers known to man, a power that drive him on against the world, against all seeming odds, against all that was rational and reasonable in life. It was the power of faith. It proved to be his – and his people’s – temporal and spiritual salvation. The Lord first led them to it, and then lead them through it. 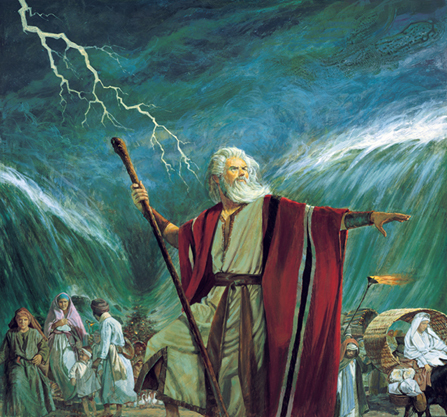 Moses didn’t get himself into a corner at the Red Sea and then think “Hum, what should I do now?” He was lead there. As our righteousness increases and our sins decrease we choose fewer and fewer of our own trials (at least choose them here, we may have chosen them in the pre-mortal life) and they become more of the trials the Lord is leading us to and through to teach us. Often as he is guiding us into a little corner we may start to worry because the solution is not clear to us. Each of us faces the time when the powers of reason come in direct conflict with faith. All the logic, all the understanding of men may swell in unison, and there alone, in opposition, stands faith – unalterable, unassailable, uunmovable- the anchor to our souls. The tides of trial can come, the ocean waves of worldly reason pound against our souls, the current and popular trends tug with all their mighty sway, but there unmoved, unfazed, unharmed is the soul that is anchored by faith. Things work out, it isn’t as bad as you sometimes think it is. It all works out, don’t worry. I say that to myself every morning. It will all work out. If you do your best, it will all work out. Put your trust in God, and move forward with faith and confidence in the future. The Lord will not forsake us. If we will put our trust in him, if we will pray to him, if we will live worthy of his blessings, he will hear our prayers. When you are being lead by the spirit straight to your version of the Red Sea, don’t deviate from the course! Keep the faith! The Lord is not searching for a solution, He is not finding one, He is waiting for you to be faithful enough to get your feet a little wet first so you have the faith necessary to part it. Don’t turn away just because you can’t see that before you get there. If the Holy Ghost is guiding you there, trust those promptings! We can do hard things, through Christ! Is there a finite atonement?